Trash can drawer boxes help hide unsightly waste while still being convenient and accessible. Choose from hanging or sitting styles with standard cutout or no cutout lid. View our selection below, then request a quote on your next job! This drawer box is designed to allow a 7-1/2” gallon Rev-A-Shelf (Part #: 6700-61-52) trash can to set inside. The drawer box would be mounted towards the bottom of the cabinet using side or undermount drawer slides. The drawer box is 10” high with a 1/4” inset around the top. The width and depth of the drawer box are defined by the customer. The minimum width for; single cutout = 9-3/4″, double cutout = 15-5/8″. The minimum depth for; single cutout = 15″, double cutout = 18-3/4″. The top is removable and can be replaced if necessary. 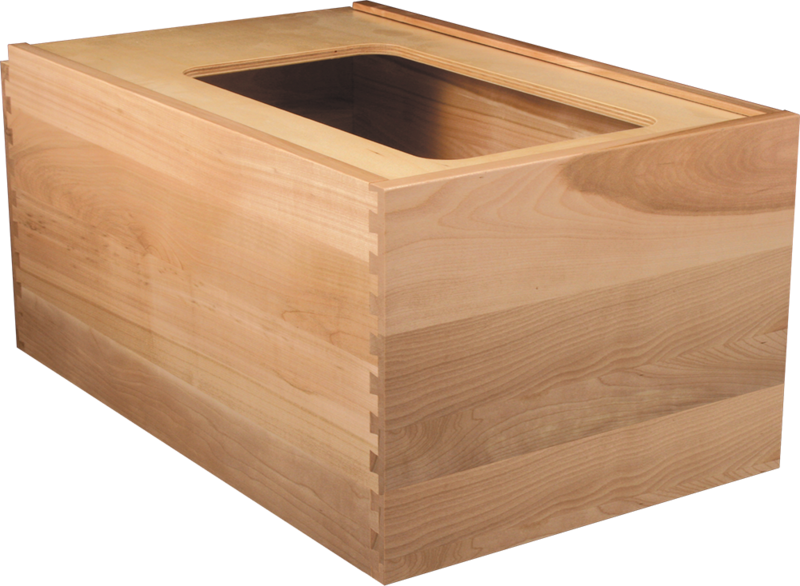 The top is 1/4” thick matching plywood, which is available with 3 options. NO cutout, the customer would make their own cutout(s). Single cutout, which goes front to back (see drawing below). Double cutout, which has one cutout in front of the other (see drawing below). This drawer box is designed to allow a 7-1/2” gallon Rev-A-Shelf (Part #: 6700-61-52) trash can to hang from the top. The drawer box would be mounted towards the top of the cabinet using side mount drawer slides. 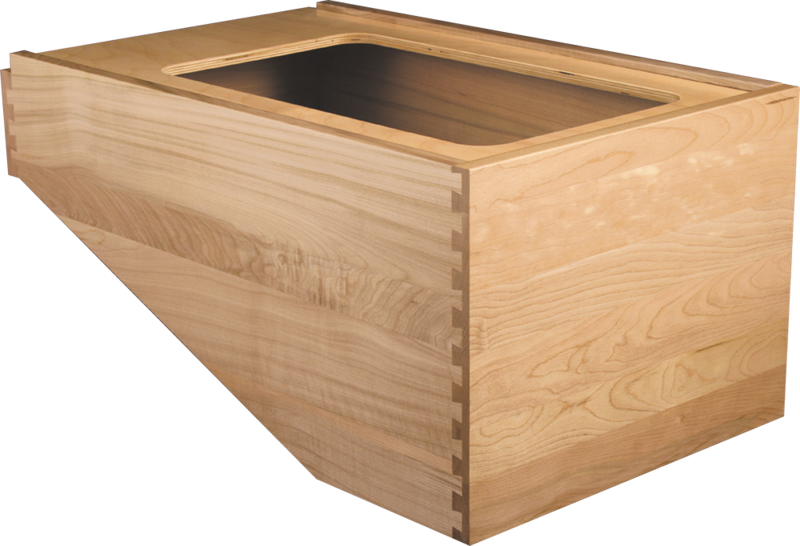 The drawer box is 10” high in the front and 4” high in the back, with a 1/4” inset around the top. 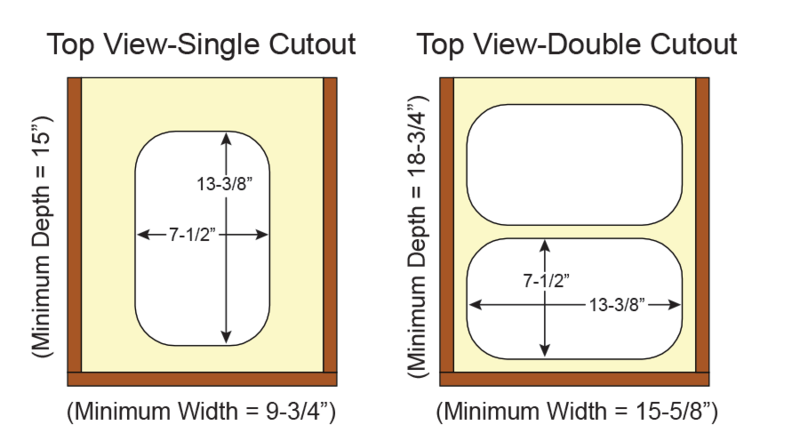 The minimum width for; single cutout = 10-3/4″, double cutout = 16-5/8″. The minimum depth for; single cutout = 16″, double cutout = 19-3/4″. The top is available with 3 options. NO cutout, the customer would make their own cutout.